At the start of the year (and after Blue Planet 2) I wanted to set a goal for reducing our household plastic. Doing it all at once just wasn’t going to work so I aimed to try and go plastic free in our bathroom (nice small goal) by the end of the year. It’s July now and we’re almost there! 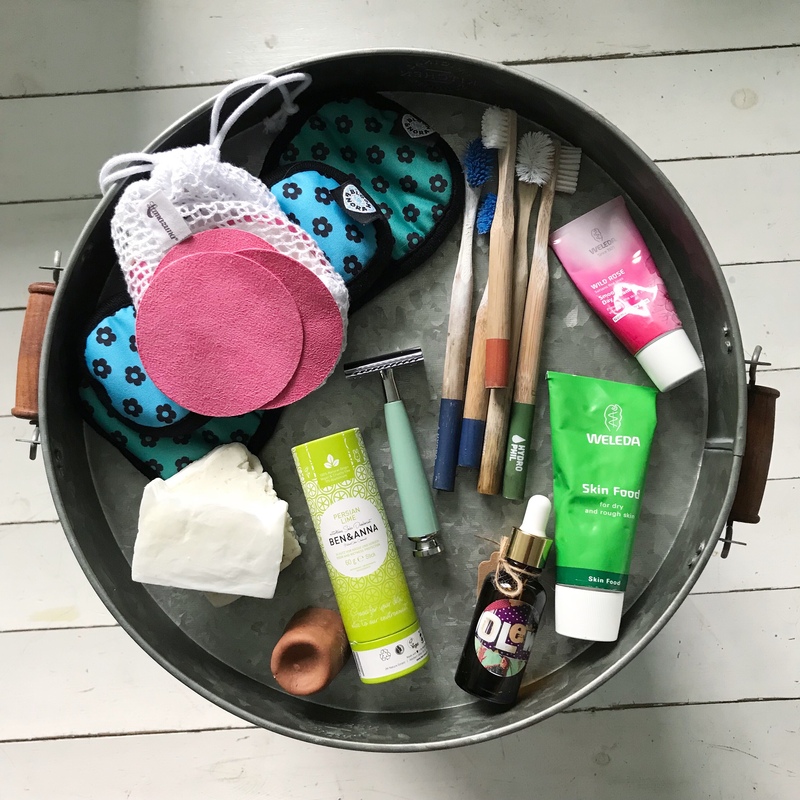 As it’s #plasticfreeJuly I thought I’d get this post up to show how easy some of the changes are! Lamazuna shampoo bars – which are amazing. Here is my blog post review on them if you’re interested! Lush solid conditioner – I’m a big Lush fan but their product ingredients still bother me a little. I’m trying to find a completely natural conditioner bar currently but for now this is zero waste at least. I do an ACV rinse (apple cider vinegar) once a fortnight too, which comes in a glass bottle. Great for curly hair! Mark is currently using a new one from Babipur from their newly launched Ben & Anna range. So far so good and beautiful packaging too and lots of choice of scents. He’s got Nordic timber and is loving it! Just need to find one that doesn’t have bicarbonate of soda in for me and we’ll be sorted! We love the Hydrophil toothbrushes here. We’ve all got one and they do the job well. We’ve been burying the handles in our garden, which is much nicer than the thought of them washing up on a beach somewhere in 20 years time, fully intact – like a plastic one would. Struggling with toothpaste though. We’ve tried a variety of toothpastes and are still struggling to find an option that works for us all. We tried going fluoride free but it immediately got clocked by our Dentist so for now I’ve bought in bulk to reduce as much waste as possible while I try to find an alternative. We use a variety of cloth wipes and flannels here to clean hands and faces. A simple bar of soap over liquid keeps us plastic free. I like the Lamazuna cloth pads to remove eye make up and freshen up with. They wash really well and the wee laundry bag they come with (as well as the gorgeous box) is very handy! We’ve all started using Weleda Skin Food as and when needed. It’s great for rough patches on knees and elbows as well as soaking into your face like a mask every now and then! Edward and I need a face moisturiser, especially during extreme weathers. I love the Weleda Rose Day Cream. The scent is really subtle and we both love it. Soaks in well, no residue and keeps our cheeks in one piece even in Gail force wind! This one is just for me. The boys don’t need any grooming products (just yet) and I let my curls do their natural thing so additional products here have always been kept a minimum, which is a bonus! I’ve just started using Olew a new brand to Babipur and it is amazing. Curls needs moisture and this oil is gentle and packed full of natural ingredients and I love it. So glad Babipur have started stocking it. Can we all just admire my new early birthday present; the gorgeous MÜHLE safety razor? It is a thing of beauty. I’ve only braved my legs so far but I survived! Even my husband has got his eye on one, definitely a win! This will be the only razor I’ll ever need. It is the perfect plastic free swap! I’m a huge fan of Muff Fluff – almost 3 years using them now and I’ll never go back to disposable pads. I love the Bloom & Nora range, they do the job, stay in place, wash brilliantly and come on different sizes depending on your flow requirements! I’m so pleased! It’s taken just over 6 months to gradually make swaps as and when needed. I’ve been all adult with my birthday present choices to make some eco swaps and I have no regrets. Did you see the razor? It’s bloody gorgeous! I just need to find a plastic free, bicarb free deodorant (for me!) and plastic free (but with fluoride) toothpaste and then we’ll be completely plastic free in our bathroom. So pleased! If anyone can help me out there I’d be really grateful so please feel free to comment below if you can give me any recommendations! *Rather brilliantly almost everything above is available from Babipur! If you haven’t checked them out before now you probably should! The code BUDDY will get you 10% off everything linked on here! Inspiring as always Team Worrall, good luck finding your toothpaste and deodorant look forward to hearing about them once found. I loved this post, thank you. Really inspiring to see how the small changes add up, and how starting with a room like the bathroom makes it feel manageable. Yes we’d already made a few changes in here so as and when needed I swapped to plastic free ones. Much easier than I thought in the end! That razor is so beautiful! 😍 I love my safety razor, it’s such a good shave once you get used to it, I’ll never go back.